Bring the right bullet for the job. I have a love-hate relationship with Bullet Hells. I really love to hate them. They make me cross in a way I don’t feel comfortable writing down, for fear I scare children, and sensitive readers flail their arms and run in a blend of horror/disgust. But Raiden as a franchise always caught my eye. 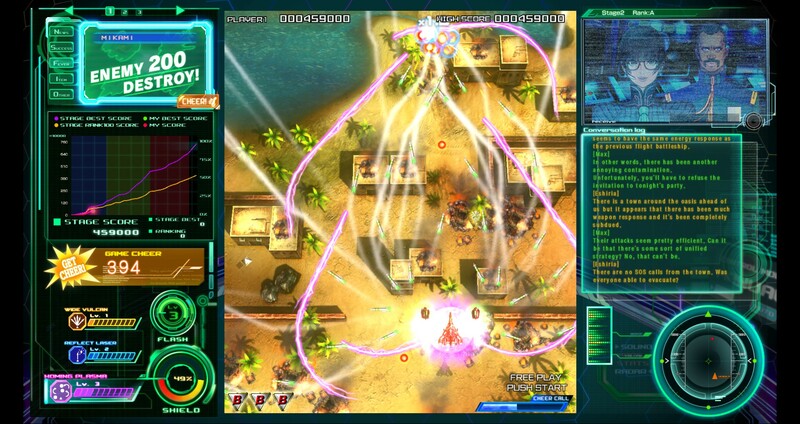 It combined the bullet hell style of dodging lasers and bullets with a jet that can dump just as many bullets onto the screen. This is terrific, but somehow makes the games even harder! Now you have to wonder to yourself, “Is that my bullet or theirs?” but fortunately yours almost always look different. But the last Raiden title I played was Raiden Trad/Raiden Densetsu in the Arcade/SNES. I spent so many damn quarters on it down by the beach with several of my friends each and every summer. So when I saw a newer one was lurking and I had somehow missed it, I jumped on the chance! PEW PEW TIME TO DIE! Raiden V: Director’s Cut is a port from console and has the benefit of added stages that were not on the regular Raiden V. There are branching paths, and it has a health bar. Well, a “shield system”, but instead of “one hit and you die”, you have a shield system before you crash and burn. When you do continue, you keep your powerups, which is another fantastic, wonderful idea that some people might think makes the game too easy. There’s a traditional mode and a boss run and it has two players … offline. Come on, this is a vertical shooter! Two players would be incredibly easy! That aside, it’s a blast to play, and though it seems to lack some of the difficulty of its predecessors for a few reasons, it’s incredibly fun and addictive. You have choices. Don’t squander them. You have three ships, the Azuma from Japan, the Moulin Rouge from France, and the Spirit of Dragon from America. Each ship has its own stats, in the Attack/Armor/Speed categories. Pick whichever suits you! From there you pick your weapon for the ship. There are gems that drop in stages, that change from Red/Blue/Purple. 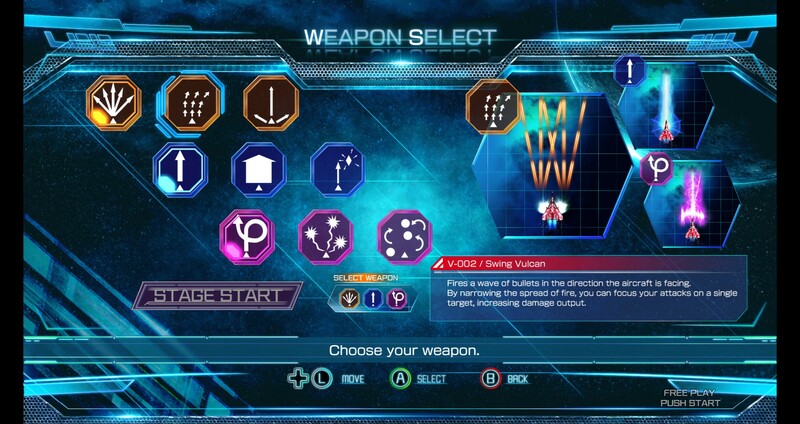 They correspond to the colors of the weapons you selected in the start. The Red/Orange selections are bullets (Wide Vulcan, Swing Vulcan, Moving Vulcan), the Blue are lasers (Lightning Laser, Charge Laser, Reflect Laser) and the Purple are Plasma (Bend Plasma, Catch Plasma, and Homing Plasma). If you keep collecting the same color, it levels up and does more fancy things, and it tracks the level (so if you swap to a different gun for some reason or another, you can go back to your level 8 Plasma, unless you want level 4 Vulcan). Personally, my favorite is the Homing Plasma, and my least favorite is the Reflect Laser. It puts out a gem that you shoot at that reflects the beam in a series of shots. It’s frustrating to use, but it has its uses, as does all of them. Though my favorite is Homing Plasma, it’s also dangerous in that it can only hit so many things at once and will no doubt put you in danger. But you also have a “Cheer Meter” that fills from killing enemies/collecting items on the map, and when its full you can hit Square to summon an ally that helps you fight! 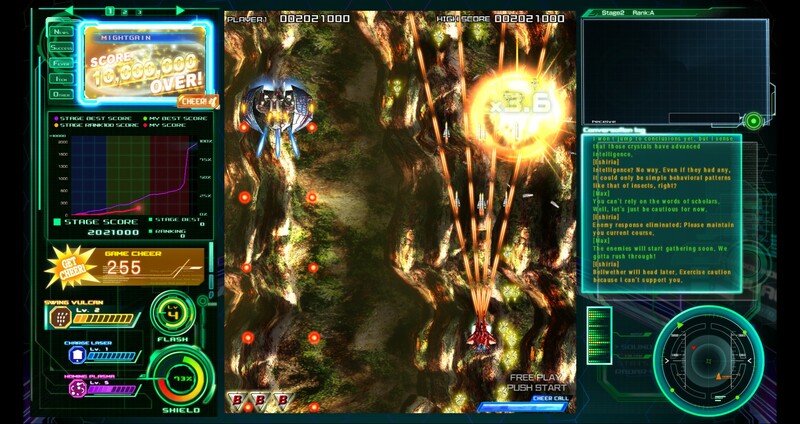 It also cancels all the enemy bulelts on the screen and boosts your sub-weapon. They appear to be other people who play the game because on the Game Over screen, you can see who cheered you on. There are also Bombs that obliterate everything on the screen (except Bosses, but still hurts them) and you start with three but can collect more. The missions are pretty straight-forward, but depending on how you perform (enemies left alive, damage taken I presume) you can lock other stages, side missions and such. Though speaking of difficulty, you have the following: Practice, Very Easy, Easy, Normal, Hard, Very Hard. In “Practice”, the enemies don’t fire, so you can learn patterns of ships, how the game works and get a feel for the controls. Personally, I only play on Very Hard, after trying Normal. Normal was no fun at all. I blazed through stages without taking a hit. But Very Hard? That’s exciting. The bullets shoot faster, so decision-making and precision dodging matter so much more. Not to mention there are 30 stages total to unlock and conquer, and that’s without Boss Rush! 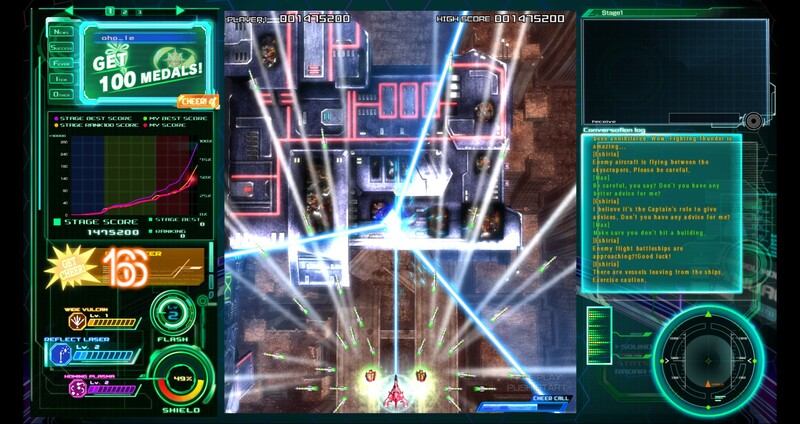 There’s plenty of replayability and challenge for even the most hardened bullet hell fan. 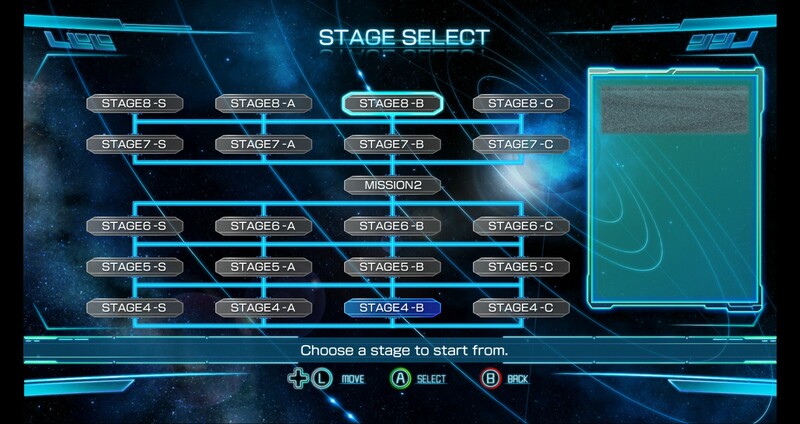 Plenty of stage options to unlock! Honestly, the only thing holding this back is being able to change the color of your ship and to feature online co-op. The dialogue between the characters is great (it’s also the first Raiden game to feature a voice cast), it stays true to the vertical-scrolling bullet hell that the franchise is famous for, it’s fast, frenetic and you appear to have unlimited continues. The stages are gorgeous, and the constant glow of various lasers, bombs and explosions keeps you locked on the screen at all times. You definitely should keep an eye on the dialogue on the right side of the screen too, when you have downtime; it tells you how you’re doing, and I think it has something to do with unlocking stages. The alternate stages also appear to have different bullet patterns, making it one more thing to keep track of. There are tiny things I don’t get, like why the little gold items don’t always come to me when a group of them are together. Sometimes they do, sometimes they don’t. Having unlimited continues almost seems to make the game too easy, but the challenge of the fights makes up for that. If there’s a limit, I haven’t found it. I play a few stages, then put it down and come back. But it’s got difficulty settings for everyone, to get used to how the game plays and then gradually go up, or if you’re like me, and want to truly experience the horrors of war, you jump right into Very Hard and do your best! I don’t like that you can only have one save slot, but you do have a stage select, so that’s a positive. And this would be fantastic for couch co-op. As a long-time fan of this series, I’m very happy with the results. It feels like R-Type and Raiden in one lovely, convenient place.